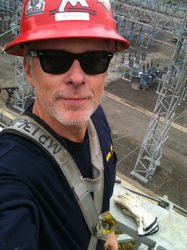 Daniel Kevin Harrison is an actor, producer, writer and electrical lineman. His anime VA credits include Gokudo, Gravitation, Madara, Shingu, and KO Beast. He has appeared in feature films such as Clint Eastwood's Bird, The Langoliers, and Wake, with Martin Landau and Gale Harold. Older viewers with especially acute ADD will remember seeing him on LA Law, General Hospital, Santa Barbara, Houston Knights, and The Law and Harry McGraw. Daniel has also developed and produced films based on the Jack McMorrow mystery series, but his REAL passion is standing 100 feet in the air supported by only 2 teeny metal spikes in order to give you the electricity needed to watch your favorite anime!